An interesting book about globalization, its effects and backlashes to countries and companies operating in the internationalism. Fact check on the global situation after 17 years from the publish of the book shows us that the Lexus is still on its way to the ideal globalization and the Olive tree is doing its job to regain its power, whether it is good or bad. 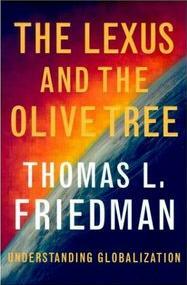 When Thomas Friedman published the “Lexus and the Olive tree” in 1999, the globalization process just got started. The Lexus stands for the enhancement of the society and the economy towards international integration. Companies set up its presence and do business all around the world. There is no longer any walls standing in between countries to stop people from being in the other side – physically and virtually. The Olive tree stands for the roots of nation, where government in one way or another utilmately fight for their territory and to reserve their culture. Globalization is a homogenizing process, it can wash away any unprotected community to replace there an identical life existing in the developed western society, particularly American. Internet is the key in this change. Communication has never been this easy, fast and cheap. The ways we communicate, invest and learn about the world becomes efficient, leading to the change of the society and each government itself to catch up with the development waves. Cold War model can not exist. Even big countries like Russia and China need to change and plug in the global market. Throughout the book, you would find many arguments and examples which underline the difference of the countries, the economies and the companies operating in the Cold War compared to in the globalization. The economy in the globalization is going to the direction of feeding innovative products and services with the premium rate, not to mass production of commodity. In the perfect globalization economy, there is no protection to weak and unprofitable companies. Practically, all the treaties being signed between countries are breaking down the protection layers in each country to reach the perfect setting. Investment in the globalization era can be in the capital and stock markets. Never before that information has been as available and accessible. There are no specific requirements for the market participants – everyone can join. Investment in the globalization can also be multinational companies doing foreign investment. They don’t only need to sell globally but also set up the supply chain to keep manufacturing down and remain competitive. Before companies established their presence overseas to compete locally in that market. Now they do so to compete globally. Organization running effectively in the globalization also changes its status quo. Before, information went up and decision made from top down. Now in this dynamic economics, top management works on strategies and keep everyone on track while working on it their way. At each layer of the organization, there are decision makers and information goes two way, up and down. Globalization is the product of the democratizations of finance, technology and information, but what is driving three of these is the basic human desire for a better life. Interestingly, the author used the computer language to describe the components of a country. The computer needs hardware, operating system and software to run. The hardware of a country is the basic shelf around the economy, whether the country follows communism, free market capitalism or a hybrid form of those. The operating system of a country is the broad macro-economic policy of the government. Software is the set of rules and laws to operate the country. Those three parts need to synchronize smoothly. The rapid change of globalization has challenged traditional business practices, social structures, cultural and environments and as a result, has generated a substantial backlash. The effects on each sector are detailed in the book. What is considered most serious to me is the challenge of community to reserve its local culture. Because globalization as a culturally homogenizing and environment – devouring force is coming on so fast, there is a real danger that in just a few decades, it could wipe out the ecological and cultural diversity that took millions of years of human and biological evolution to produce. There are two ways to make a person feel homeless – one is to destroy his home and the other is to make his home look and feel like everybody else’s home. In general, I have learned much from this book. It includes basic information about the world and business in the globalization era as compared to the Cold War. The opinion might be to much in favor of the ideal free market. Thomas Friedman predicted that joining the global herbs would be a must if a country wishes to thrive. Fact check on the global situation after 17 years from the publish of the book shows us that the Lexus is still on its way to the ideal globalization and the Olive tree is doing its job to regain its power, whether it is good or bad.